John Geiger, Vice President Business Development, MACHFU, shows how Conventional IoT approaches to enterprise/edge connectivity in oil and gas production are being upstaged by new application gateway technologies. Like many industrial areas, the oil and gas industry is in the midst of an industrial Internet of Things (IIoT) evolution. Every oil and gas producer is connected to the their assets, but not all are fully connected from edge to enterprise. And even fewer are able to easily integrate their legacy implementations with new IoT deployments. The IIoT evolution enables scalability, and stresses interoperability, creating an interconnected, rapidly evolving ecosystem of solutions and analytics that enable better process control and broader business insights to emerge. Gathering data from industrial devices at the edge (sensors, alarms, controllers, equipment, valves and actuators) is key to unlocking these insights. The edge data is pushed up to the cloud, independent from legacy systems like SCADA, then interconnected with data pulled from SCADA, permitting a broader, system-wide application of analytics to occur. a) Will our systems that have gotten us to where we are today need to be undone? b) Will our hardware need to be replaced, and if so, at what cost? c) Will our existing SCADA functionality be interrupted? d) Will custom embedded solutions need to be reengineered for each of our thousands of edge devices to make them IoT compatible? These are tough questions for those charged with transitioning their plants’ legacy systems to full IIoT connectivity, largely because the answer to each of these questions is ‘yes’. That is, if conventional IoT approaches to enterprise/edge connectivity are being implemented. 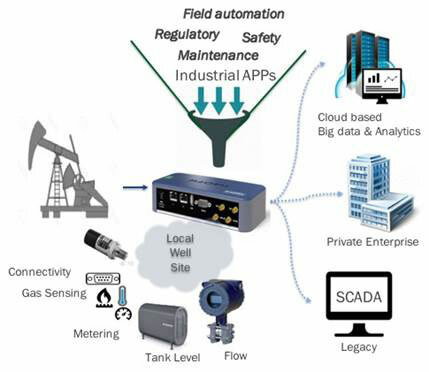 Recently released application gateway technology, however, has now diffused these issues for oil and gas production, enabling highly-scalable enterprise infrastructures with plug-and-play simplicity, that maintain existing SCADA functionality, and without the need to replace existing hardware. The emergence of IIoT platforms – such as the OPC Unified Architecture (OPC UA) widely adopted by oil and gas producers – and the use of application gateways are enabling the collection of more data in a timely fashion. The new IIoT application gateways cost-effectively provide wireless and wired connectivity that enable the unification of modern web-based applications and traditional SCADA infrastructure. They also virtually eliminate the need for costly new equipment. Here’s an overview of how these new gateways support oil and gas producers – with a focus on MACHGateway® from MACHFU, a good example of how these new devices perform. In traditional oil and gas applications, specific data from a single operation is monitored and collected by SCADA, which then issues commands to control that single operation. For example, well data is used to optimise the output of a single well. With today’s IIoT platforms, that same well data can be used in several applications including overall equipment effectiveness (OEE), loss, waste, production efficiency, and even identifying if differences of efficiency exist between wells on the pad. Within this framework, data should no longer be polled just for a specific application. It should be collected to a big-data cloud database which is designed to efficiently provide information to different applications that are requesting data. This means that as much higher resolution data as feasible should be gathered from the oil pad and made available in a common format, to allow for broader usage and analytics. Application gateways, like MACHGateway, are enabling this high-volume collection of edge data, in addition to uninterrupted SCADA polls. With the gateway, control can be initiated from SCADA, the cloud or from a tablet in a mobile field force. This applies to remote configuration and management updates as well. Traditional SCADA uses centralised back office systems to gather information from remote devices. These systems use polled architectures on serial connections developed 30 years ago, before the advent of the Internet and high-performance processing, that is taken for granted today. New IIoT architectures are removing the limitations of these older polled systems, and bridging existing devices to leverage IIoT systems that move intelligence to the network edge. 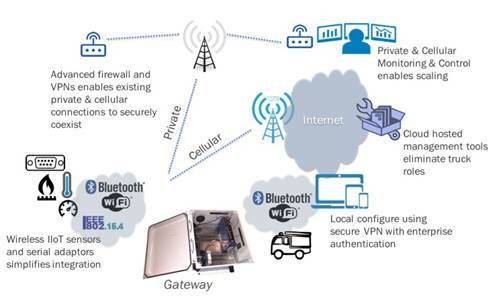 The MACHgateway collects data locally by polling the device, and maintaining device connectivity with existing SCADA systems. Such gateways constantly poll devices at the edge, assessing the system state every second, compared to a traditional 15 minute or longer SCADA polling interval. The data gathered is used to create a data model that can be easily understood by other applications and translated to other protocols, allowing the data to be shared in real time with the ecosystem of emerging IIoT applications. As opposed to traditional approaches for industrial edge connectivity, which are based on developing custom embedded solutions that require reengineering for each device, application gateways, including MACHGateway, leverage the new high-performance hardware platforms using a hardware-independent Android/Linux-based software platform. Application gateways simultaneously leverage chip/module-based connectivity solutions that are lowering wireless connectivity costs. These gateways provide many features that simplify the development of edge applications by reducing the time to create and integrate them, reducing development time from months or years, to weeks or even days. This enables innovative edge applications to be created and rapidly integrated to existing infrastructure and IIoT applications. In addition, new applications and business models can be continuously created over the life of the system. SCADA systems that tie together decentralized facilities, such as oil and gas, were designed to be open, robust, and easily operated and repaired, but not necessarily secure. Concerns about SCADA systems being vulnerable to cyberwarfare and cyberterrorism attacks have increased the need for heightened security within the IIoT. In October 2017, the U.S. Department of Homeland Security and the Federal Bureau of Investigation issued a rare warning that sophisticated hackers were targeting energy and industrial firms. Some of the attacks against nuclear, energy, aviation, water and critical manufacturing industries had successfully obtained credentials for accessing the computer networks of their targets. Application gateways, being based on Android technology, have defense-in-depth security built across the layers of the communications stack all the way up to the application layer. Consequently, they implement the best practices of IT security, considerably exceeding that provided by SCADA systems. The MACHGateway, for example, was built from the ground up with security in mind. The platform has a secure sandbox for different applications, each with its own crypto-technology for data and sharing of data between applications. Importantly, however, the security built into this gateway does not put a heavy burden on the system. In the oil and gas industry, the challenge to enable connectivity and convergence is largely dependent upon the acceptance, implementation and performance of industrial IoT platforms and the new application gateways. These open the door to simpler IoT accessibility from edge to enterprise, with improved asset utilisation, higher process efficiency and productivity, and lower cost of operation.